Step 1 In a medium sized bowl, mix together the potato starch and a few dashes of salt. In a sauce pot, melt the palm shortening over medium to medium-high heat. The smaller the sauce pot the higher the oil level will be, but the smaller the batches will be, so choose accordingly. Line a pan with a few layers of paper towels and set next to the oil. Blend the ingredients for the sauce together in a blender or small food processor. Step 2 While the oil is heating up, make double sure your calamari tubes are cleaned by sticking your fingers inside and checking to see nothing gelatinous is inside. This would be a great task for a little boy, huh? If there is, pull it out and throw it away. Slice the tubes into rings. Leave the tentacle whole. Step 3 Working in batches, lightly dredge the rings in the starch and toss them into the oil. Don’t over crowd or they’re all stick together. You want to hear the sizzle and see bubbles. If you don’t, the oil isn’t hot enough. 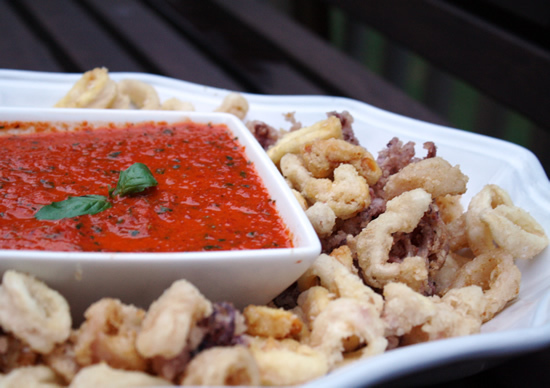 Using a spider or slotted spoon, swirl around the calamari every few seconds until they’re crispy. You’re NOT looking for brown-ness. Browned potato starch tastes burned. Test one or two out if you need to, before pulling the whole lot out. Place on the lined pan and sprinkle with salt. Calamari is cheap, cheap, cheap. I paid $5/lb for wild caught. I know calamari can lend itself to more versatile recipes than just deep frying–but it’s just so goooood, I couldn’t help myself. There are no messy dredging stations and “club hand” simply does not exist.